Looking back on my first year of hiking in Virginia is pretty amazing! And here it is in glorious detail (of course you can be the judge of how interesting it is). With the many miles and locations, including Peru and Arizona, it truly was - to me - a year to remember! First hike! Took Poverty Creek trail from parking lot to the pond. Then walked around north and east sides of pond to Horse Nettle to Lady Slipper to Larkspur to the pond and to parking lot. Took Horse Nettle trail from parking lot to FS Rd 188-2 to unnamed trail about 1.5 miles along road. Trail was extremely steep and intersected with Joe Pye trail near Poverty Creek. Went left on Poverty Creek to another unnamed trail, now dubbed "Woody" in honor of my dad Norwood (see 8/30/03 entry). Went about half mile and turned back, realizing we were going the wrong way. Returned to Poverty Creek trail and to parking lot. Met LuAnn at Pandapas Pond and she followed me to intersection of VA 42 and A.T. Parked her vehicle there. Drove together to 658 and parked at John's Creek Mountain trailhead. Started hiking forest road, not realizing we were not on primary trail. Missed primary trail to A.T. and dead ended on road. Decided too far to retrace to trail and bushwacked to A.T. by compass. Took A.T. to Laurel Creek Shelter and had lunch. Continued on A.T. to VA 42. Rainy day initially but partly cloudy after lunch. Beautiful multiple small waterfalls along creek after shelter! Returned to LuAnn's car 12:10, then drove to end of 658 for beautiful view of mountains. Returned to my car at John's Creek Mountain trailhead and decided to walk primary trail for a few miles. Startled wild turkey and chicks. Last trip duration 13:00 to 14:20. Took Horse Nettle from parking lot all the way to end, then Jacob's Ladder to Poverty Creek to parking lot. Mom's first hike! Jacob's Ladder beautiful and quite steep in places. Same route as with Mom on 7/17. Saw what appeared to be Pileated Woodpeckers off trail about 50 yards. Couldn't confirm. Took Poverty Creek from parking lot to Joe Pye trail. Trail poorly marked and ended up on Larkspur to Lady Slipper to Horse Nettle. Went to near end of Horse Nettle looking for Snake Root (not marked). Ended up on unnamed trail which backtracked to road turnaround. Went back to unnamed trail start because I saw Goat's Beard at that point. Took new trail which ended up to be Snake Root. Snake Root is beautiful! Narrow trail along edges of five deep ravines. Breathtaking!!! Many switchbacks. Trail leads back to Poverty Creek and took that to parking lot. First order of business was to find out where I went wrong on Joe Pye earlier this week. Took Horse Nettle from parking lot to Joe Pye, then to where I had lost the trail on Tuesday. Again, trail is poorly marked with two double blazes, which is very confusing. Decided at that point to confirm Larkspur was trail heading north from the intersection. Did confirm it and trail leads to the pond. Walked along south side to pond to where I thought Lady Slipper was and confirmed that also. Took Lady Slipper to Horse Nettle to Snake Root. Met mountain biker Patty at third ravine. She said she's seen bears in area and also told me about vista on or near last section of Poverty Creek trail looking back at Brush Mountain. Continued on trail to Poverty Creek and took side trail back to pond. Found nice little rapids where Poverty Creek exits from pond. Returned to car via Horse Nettle. Realized easier to park at pond to walk trails. 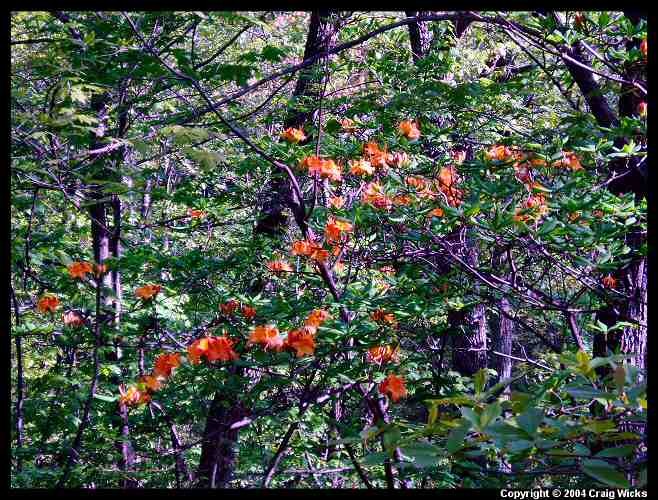 Wanted to take Jody to Snake Root and also have both experience the long tunnel of Rhododendrons on Larkspur. Saw two box turtles on Horse Nettle. Same route as yesterday. Saw another box turtle on Horse Nettle, plus a snail. Took Woody off Poverty Creek north to FS Rd 269. Saw a large doe. West on forest road to Prickly Pear trail. Very steep. Took Skullcap trail (also steep in places) at junction to Trillium, which ends into Poverty Creek. Saw a large group camping at that point. Returned to parking lot via Poverty Creek. Several creek crossings and some beautiful rapids and small waterfalls. We were ready to stop hiking after Trillium but had to go on. After hiking went to Back Country outfitters. Took east trail to lower Cascade Falls along Little Stony Creek. Spectacular! Endless rapids with huge (all sizes) boulders. Stopped at the lower falls to rest and take pictures. Continued on west trail, which leads back to parking lot, but turned right on upper falls trail to the falls. These falls are not advertised and really have no facilities for the public to view them. We were able to navigate a path along the creek and find a good spot to view the falls and take pictures. The Upper Falls are not as high as the Lower Falls 60 foot drop but they were wider and very beautiful. Returned to parking lot via the west trail. Returned to do the complete John's Creek Mountain this time! Parked LuAnn's car on VA 42 near the A.T. and mine up at the trailhead on VA 658. Hiked the trail along John's Creek Mountain ridgeline to the A.T. Saw two salamanders and a garter snake. Turned left on the A.T. and saw a white tailed doe. Continued on the trail and topped at Kelly's Knob overlook for the view. It was magnificent! A good 180 degree view to the south and southwest on top of a huge rock outcropping. Stayed for about 20 minutes to rest and eat some trail mix. Left the overlook and met a couple enroute to the Knob (Andy & Michelle Hall). Continued on trail to Laurel Creek shelter, stopping again for about 15 minutes. Returned to LuAnn's car at VA 42, when she discovered she had left her keys in my car back at the trailhead, probably about five miles away. As luck would have it, The Hall's had finished their hike and were back at their car near LuAnn's. They agree to give us a lift to my car! Parked at the lower lot and hiked Poverty Creek to Snake Grass. Took Snake Root up to Horse Nettle and followed the old jeep trail to the start of "Beauty." 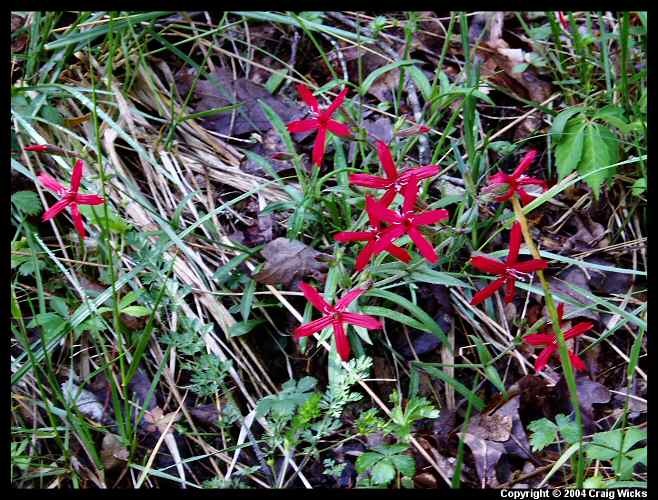 Beauty is somewhat similar to Snake Root, following a narrow path around deep ravines. Several decent openings to see surrounding terrain. Also a nice pine forest area. Came out to the Poverty Creek trail and returned to the parking lot. Decided to bushwhack from LuAnn's house to Horse Nettle. Followed creek on west side of her street as far as possible, then followed crest of ridge along creek, which eventually lead to a two track to the top. Ended up coming out at the little red cabin on Horse Nettle, just before FS Rd 188-2 ends where an old lookout tower stood. Returned to LuAnn's house via the two track until it ended at a gated pasture. 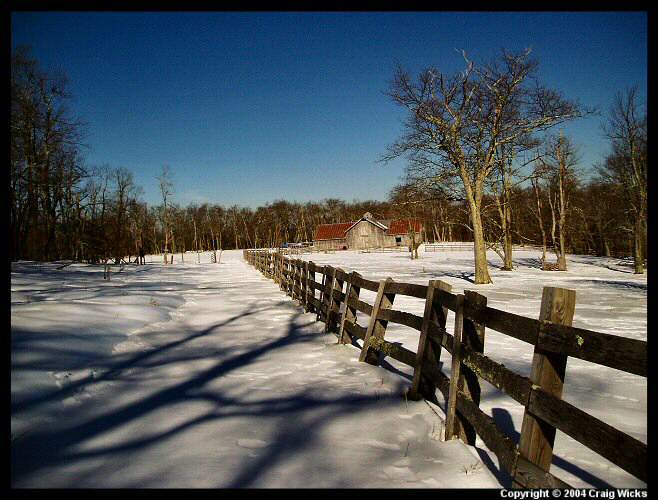 Followed the pasture fence, which led to LuAnn's backyard. Parked in lower lot and followed Poverty Creek trail to Joe Pye to Horse Nettle. Walked the Horse Nettle/FS Rd 188-2 to the old lookout tower turnaround. Saw a huge Great Horned Owl as I walked along the road. Took trail at turnaround to the Snake Root trailhead, then a very steep side trail off Snake Root to Jacob's Ladder. Saw a couple deer in the ravine below the trail. Crossed Poverty Creek and returned to the parking lot via that trail. From lower lot, took pond path to Lady Slipper, to Horse Nettle, to Jacob's Ladder, to Poverty Creek trail and back. Basically the same route as yesterday, with one variation. From lower lot took Poverty Creek to Woody, then FS Rd 269 to Queen Anne. Returned same. Woody and Queen Anne trails are very nice and fairly easy to hike. After breakfast at "Famous Anthony's" in Blacksburg, took Harding Rd to Blacksburg Rd to VA 311 (Catawba Dr) to parking area where AT crosses. Absolutely a wonderful hike and day! McAfee's Knob is about 3.7 miles from the parking area, with two shelters along the way. Hike is up and down until the last mile where it becomes somewhat steep. Arrived at the Knob around 10:45 and LuAnn had packed two Bud Lights for us to celebrate, opened at 10:50. We had the Knob to ourselves for about 45 minutes when the first group of a wedding party arrived. The view is SPECTACULAR! Took many photos. 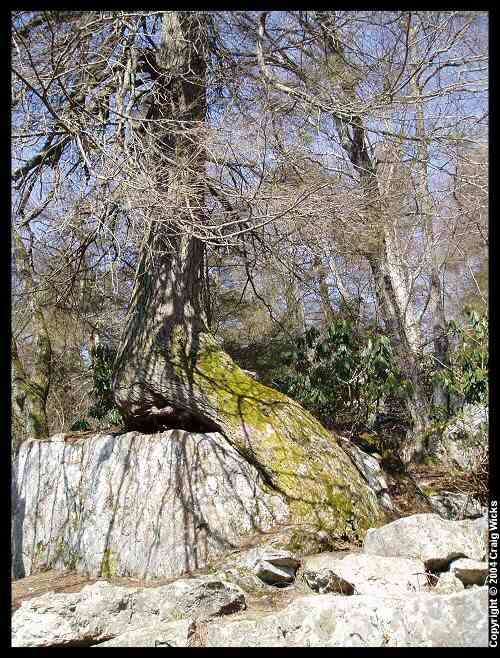 At about 11:30 we decided to visit Devil's Kitchen, about 0.10 miles further along the AT. Huge cubical boulders of sandstone haphazardly "placed" and cool to visit. The AT twisted though them. Returned to the Knob and got ready for lunch. LuAnn selected a flat boulder in the shade and set out the food. Upon sitting down, a young Copperhead snake stretched out between her legs from underneath the rocks. LuAnn quickly moved away and tried to "encourage" it to come out with a small stick. Looking back underneath the rocks, another larger head appeared... Momma. We moved to another boulder. After a leisurely lunch and some more sightseeing, we left the knob at 12:30. People continued to arrive for the 14:00 wedding, and LuAnn noted that they really weren't prepared for the hike... not much water. On our way back to the car we ran into the groom. He told us that he had gone up earlier that morning and had seen two bear cubs, one of them climbing a tree and the other passing across the trail behind him. We wondered where Mrs. Bear was. Also seen was a cool lizard on one of the footbridges along the trail. It didn't seem scared and we donated some bread. Back to car at 14:15. First time out with the GPS, which plotted our track. Eventually found out that card was bad and couldn't save track. Card replaced at Radio Shack. Yay! Took the usual pond route to Poverty Creek trail, to Woody, to Goat's Beard (new trail on the other side of FS Rd 269), to Prickly Pear and then to Skullcap. After exiting Skullcap to the forest road, took very steep path back to Poverty Creek trail. Our track saved on GPS for the first time now that the card has been replaced and is working. First time plotted track on quad software. Very Cool, elevation profile included! GPS tracking mission! Parked at upper lot and took Horse Nettle to end, at Jacob's Ladder. Saw Doe and Buck White Tails. Backtracked to Snake Root and took that to Poverty Creek. Saw two Does. Poverty Creek to Joe Pye, to Lady Slipper, then back up Lady Slipper to Larkspur. Managed to get five separate GPS tracks for the day! Short hiking day. Took Poverty Creek to Joe Pye to Lady Slipper, then walked along the nature "bridge" and back to parking lot. Saw two ducks or geese that I have yet to identify. Obviously male and female, with red heads above their eyes. Male black with white back, female brown (or gray). Took Poverty Creek to Woody to Goat's Beard to Prickly Pear to Skullcap to Trillium. Then Poverty Creek for awhile. Saw several groups of runners who, upon LuAnn's inquiry, said they were with the VT cross country team. We decided to leave Poverty Creek and walk FS Rd 269 until we came to Queen Anne and then take that back to the parking lot via Skullcap, Prickly Pear, etc. Poverty Creek to Woody to FS Rd 269 to Queen Anne. Decided to give Mom and Jody a taste of Skullcap, Prickly Pear, and Goat's Beard, returning on Woody and Poverty Creek. Saw large dead toad on road and salamander on Skullcap. Took Horse Nettle from upper lot to FS Rd 188-2, seeing two deer, then back to Joe Pye to Larkspur, and around the pond to Horse Nettle again and the lot. Saw those two ducks/geese again, close-up this time. GPS tracking mission. Took Horse Nettle to Jacob's Ladder to Jeep Trail to Beauty to FS Rd 269 to Woody to Poverty Creek and the parking lot. Light rain to start... Poverty Creek to Woody to Goat's Beard to Prickly Pear to Skullcap to Trillium. Started to rain hard, with trails turning to mini-creeks. Went back to lower lot the same way. Awesome hike to Dragon's Tooth. Took blue-blazed trail from parking lot with steady climb to the tooth. Towards end, many rocks and boulders to climb. Nice short hike today. From lower lot took Poverty Creek to Woody to Goat's Beard to Prickly Pear to junction of Skullcap and back to lot via same path. Saw two deer. Not much of a hiking day. Went to Dismal Falls, after some difficulty finding it. After taking pictures, followed a trail along the creek to a mini Dismal Falls. Startled a Great Blue Heron there. After the falls, went to the AT to get Mom on the trail. Hiked about .5 miles and then came back. Took Poverty Creek to Joe Pye to Horse Nettle to Teasel, trying to find trail LuAnn and I took on our second outing together. Was not the same trail. This was steep and eventually intersected with Goat's Beard that terminates into Joe Pye. Possibly this second trail was the one I was looking for. Revisited Stinging Nettle from Joe Pye. 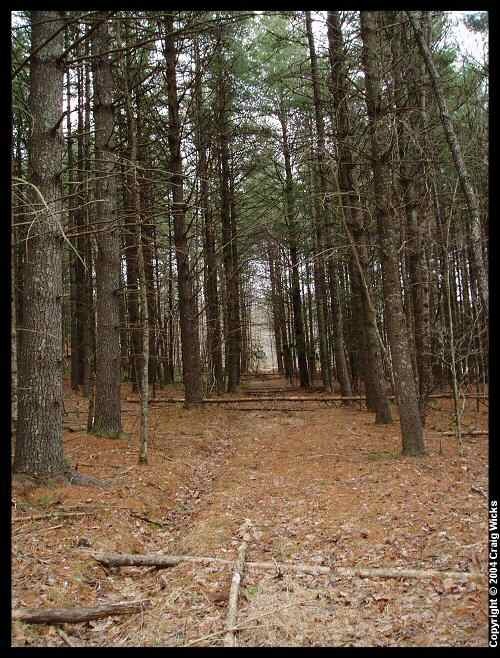 This was the trail LuAnn and I took back on 7/8/03. EXTREMELY steep at the end and an intense workout! Probably is best left to travel downhill only. We continued our hike via Horse Nettle and Snake Root. Short hike today... From upper parking lot, took Horse Nettle to Lady Slipper to Larkspur. Then around the Pond, across the nature bridge, and back to the lot via Horse Nettle. LuAnn and I had driven the two forest roads associated with Pandapas Pond the day before. 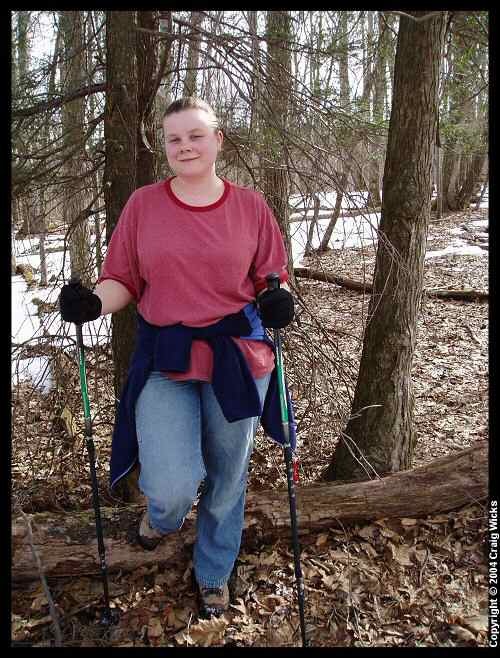 I suggested to Jody that she drive to the start of Trillium for a short hike, which we did. Went a few hundred feet on Skullcap also but decided to return to the car. We were burning the trails up this morning... six miles in just over two hours! Decided to take a portion of Queen Anne that we had never walked, then took FS Rd 269 to the other start of Queen Anne. Saw seven deer during the course of our hike. Huckleberry or Flat Peter Loop (North Fork, Dixon Branch, Dismal Branch, & Kelly Flats trails). Ambitious six hour hike with the girls, beginning with an excellent breakfast at Joe's Diner in Blacksburg! Had a bit of difficulty getting started because the trails are not well marked. This problem continued throughout the hike, primarily due to faded blazes and indistinct trails. An awesome hike though with multiple stream crossings, many of which required some ingenuity to get across. Even so, wet feet prevailed. Didn't see much wildlife... a caterpillar and a deer (LuAnn saw). Did see some deer and bear scats. Began our trek with the North Fork trail and followed the loop to conclusion. As advertised, the most difficult portion of the trip was along the Dismal Branch trail, with portions completely obscured or missing. Also had a major blow down on the first leg of our trip with forced us to bushwhack. Also took a wrong turn during the Kelly Flats leg and followed a road that led to a meadow... and nowhere. Parked at lower lot and took Pandapas Pond trail to Horse Nettle to Snake Root, to Poverty Creek and back to lot. Basically same route as 9/4/03 hike. Saw several toads but nothing else of note. Trip to Cascades with our Michigan visitor, Judy Bodjack, and Mom, Jody, and Wayne. All had never been to the Falls. Initially took lower trail along Little Stony Creek to Lower Falls. Judy and I booked and arrived at the Falls about 20 minutes before the rest. Lots of photo ops. After everyone made it to the Lower Falls, Judy, Mom, and I took off for the Upper Falls, about 3/4 mile further up the creek. As with the trip here with LuAnn, we had to carefully navigate along the creek to a good spot to view the Falls. Returned to the Lower Falls and everyone took the upper trail back to the parking lot. I did the last mile in 15 minutes, 4 mph! Had lunch at "Tickle's" after the hike. Mom and I took Judy for a hike at Pandapas. Lower lot to the Pond trail to Larkspur to Joe Pye to Horse Nettle to Stonecrop to Snake Root to Poverty Creek. Made a short detour up Woody to show Judy where Dad's ashes were scattered. Quick hike this morning because taking Judy to Blue Ridge Parkway. Lower lot to Woody to FS Rd 269 to Prickly Pear to Goat's Beard to Woody to lot. Another quick hike prior to trip to McAfee's Knob. Poverty Creek to Snake Root to Horse Nettle, then down Teasel and Stinging Nettle to Joe Pye and back to lower lot. LuAnn and I took Mom and Judy to McAfee's Knob for Judy's last hike. Took forest road this time to AT to the Knob. Saw and photographed a raccoon in a tree. Had lunch on the Knob and took photos. Beautiful day... very sunny with cool clouds. Took Pandapas Pond to Horse Nettle to new trail that LuAnn had been on in the past, off Horse Nettle near FS Rd 188-2. Took the trail to where it ended at a power line easement, then took easement almost to US 460 and bushwhacked across forest to upper parking lot. Took Poverty Creek from lot to the Pond and lower lot. Short hike along Roaring Run Creek to very nice Falls of the same name. Located NW of Roanoke just off SR621 (take US220 North to SR615 at Bessemer to SR621). 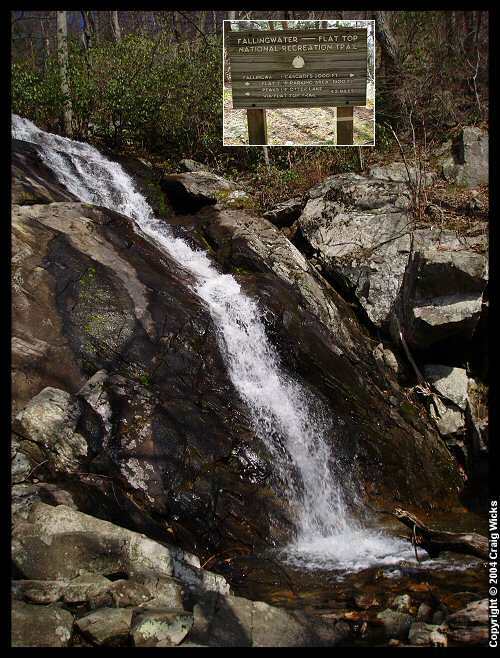 Look for USFS sign "Roaring Run Furnace." Many picture opportunities. Easy hike on maintained trail. Well worth a visit! Tried to find new trail then went to Craig Creek road to try to find Powerline trail. No luck with either so went to the Pond. Took Poverty Creek to Joe Pye and found new trail that paralleled Joe Pye, eventually rejoining Pye near Larkspur. Continued on Joe Pye to Horse Nettle to Pandapas Pond to lower lot. Finally learned exactly where the new trail was (officially named Gateway, but previously known as Old Farm). Took it to Horse Nettle to the other new trail that LuAnn showed me Saturday. Returned via the same route. Got GPS tracks of new trails and connector trail between Snake Root and Jacob's Ladder. New trail adventure for LuAnn and I. Took War Spur trail to overlook, then continued on War Spur to AT then Potts Mountain trail to a rock outcropping and then to Wind Rock, another overlook. All overlooks had fantastic views, with fall foliage near peak. Started to return to car via VA613 and decided to hitchhike instead due to time constraints, i.e. we wanted to have lunch at Mountain Lake Lodge. Picked up by older gentleman in pickup and made it back on time. AT portion of hike was EXTREMELY steep and long to summit of Potts Mountain... definitely strenuous! Kilometer 82 (9,000 ft) to Wayllabamba (9,840 ft) - Transportation from Cusco was a small tourist minibus that seated about 20 people. It was around 10:00 AM before we were on our way. The trip to Kilometer 82 took about two hours, with a brief stop at Chilca to visit the market. After arriving at the trailhead, we put on our packs then checked in to sign the entry log and show them our "admission ticket." Next, we had to show our passports at the entry point of a small footbridge over the Urumbamba River. Crossing, our trek had begun! The Trail follows along the left bank of the Urubamba gorge (river on our right) for several hours, with views across the river of terraced farmland, snow-capped mountains, a glacial valley, and a small, inhabited Inca ruin. Before reaching our first ruins at Llactapata we stopped for lunch at a campsite with several adobe homes in the vicinity. Shortly after lunch we arrived at Llactapata (7,550 feet above sea level). We stayed on the Trail and did not descend into the ruins themselves. From there the Trail turns south, away from the Urubamba and up the valley of the Río Cusichacha, about four miles to its junction with the Río Llullucha, where the Trail turns west and follows the Llullucha. Just above the junction of the two streams is the small village of Wayllabamba ("Place of Good Pasture," the only inhabited village on the Inca Trail). This is where we spent our first night, reaching it at about sunset, around 6:30 PM. The porters had already set up our tents and we had tea and dinner under a thatched roof, open sided structure. Click HERE for more about our trek on the Inca Trail. Wayllabamba (9,840 ft) to Pacaymayu (10,991 ft) - We woke up early and had a quick breakfast. We were now at 9,840 feet elevation and we had to climb over the first and highest of the mountain passes between Llactapata and Machu Picchu. At Warmihuañusca, or more popularly known as "Dead Woman Pass," the Trail reaches an elevation of 13,772 feet. From our campsite, the Trail winds steeply along the south side of the river towards this first pass, cutting through dense vegetation until reaching Llulluchapampa ("Place of Offerings"), a large pampa just below the first pass where we are to have lunch. Today's trek WAS very difficult for LuAnn and I. We were certainly physically in shape for the journey but the high altitude was taking it's toll and starting to impact our breathing and the speed at which we could hike. With the extremely steep grades that we had to travel, we ended up pacing ourselves by walking about 50 yards and resting for a minute. By the time we reached the pampa for lunch we were thankful for the break! Llulluchapampa overlooks an open meadow where llama and sheep were grazing. Tall mountain peaks surrounded us and we could see the Trail struggling up the mountainside towards Warmihuañusca pass. We knew it was going to be a heart-pounder! After lunch, the going continued to be very difficult for us and we let the rest of our group go on ahead. We made it to the top of the pass early in the afternoon. It was very windy and cold, with sleet and drizzle falling. Because of the poor visibility, the magnificent views were obscured in clouds. From the pass, it would be a steep downhill all the way to our campsite for the evening at Pacaymayu, along the Pacamayo River. Going down took less effort and we made better time, but it is very hard on the knees and you always have to pay close attention to where you place your feet or face the consequences. At this point the Trail was composed of thousands of stones. Darkness was beginning to set in by the time we made it to our camp. LuAnn was not feeling well and decided to skip tea time and dinner. For the rest of us, after dinner it was another early night to sleep. Pacaymayu (10,991 ft) to Wiñayhuayna (8,366 ft) - We had another early breakfast and broke camp. LuAnn was still ill, but got herself ready and actually started out before the rest of us! We were going to hike ten miles today, the most one-day distance of our trek. From our camp, the Trail climbs steeply up the opposite side of the valley wall, towards the second pass. Though not as high as Warmihuañusca, Runcurakay Pass tops off at 12,631 feet and there would be a third pass to traverse as well. I caught up to LuAnn in about fifteen minutes, and we returned to the pace we used the day before and slowly made our way up the steep trail. About halfway up is a circular, walled Inca ruin known as Runkuracay ("Pile of Ruins") and sits at 12,139 feet elevation. Beyond, the Trail continues to climb towards the pass of the same name. Enroute we traveled by a small alpine lake (really a pond), and just a short time later reached the pass. The temps were warmer than the day before and it was clearer allowing us to enjoy the spectacular view on all sides. On the other side of the pass, the Trail descends towards a valley containing another shallow lake, bigger than the one we had passed earlier. At around this point, the Trail changes from a dirt path to a narrow stone roadway, the beginning of the true Inca Trail, as the stones of the roadway were laid by the Quechua people of the period of the Inca Empire. From here, the Trail leads to a second, larger Inca ruin, Sayacmarca ("Town in a Steep Place"). This complex lies at 11,811 feet above sea level and was about three miles from the Runcurakay ruins. Our group had already climbed the narrow stairway and were exploring the ruins, but we had had enough of stair climbing and decided to wait for them outside the ruin. About a half hour past Sayacmarca, at a place called Ponchamarca, we stopped for lunch. From here, much of the Trail shows superb engineering, built into the steep hillside on top of Inca stonework. After passing through some of the wildest rugged scenery imaginable and over the third pass (11,975 ft), we looked directly down on to the ruins of Phuyupatamarca ("Cloud-level Town"). The ruins are reached by descending - what else - a long flight of stairs. Leaving Phuyupatamarca the Inca Trail descends an unbelievably long series of winding steps, literally thousands and thousands, with many cut into the living rock, eventually reaching Intipata, another ruin. It was starting to get dark as we continued on the Trail, finally reaching our camp at the Wisayhuayna Visitors Center around 7:30 PM. Wiñayhuayna (8,366 ft) to Macchu Picchu (7,874 ft) - Breakfast at 4:30 AM (ugh! ), and ready for the Trail at 5:00 AM. All of us were given a "box" lunch and then started out for the final destination of our trek. From Wiñayhuayna, our hike took us through shifting panoramas: It was fantastic, incomparable! After no more than two hours, we reached a narrow flight of stone steps leading upwards into a small stone structure with a grass floor. This is Intipunku, Gateway of the Sun or Sun Gate, and through the rectangular doorway just moments after sunrise, we had our first, unforgettable view of Machu Picchu... the mysterious gray stone city mounted like a gem in a setting of cliffs and canyons. Intipunku is called the Gateway to the Sun, because it is located in a notch on a ridgeline, which allows the first morning light to stream into Machu Picchu. We spent about twenty minutes looking down at Machu Picchu and taking scores of pictures. It was breathtaking! Finally, we started down a broad, flagstone paved trail - the view improving at every turn - a trip of about 30 minutes to reach the Watchman's Hut in the upper part of Machu Picchu. Soon after, we made our way to the main entrance. We had done the Inca Trail! Took Gateway from parking lot on Meadowbrook Drive to Horse Nettle. Nice return from Peru hike with Mother and Jody. Returned to lot the same way back. Took Woody to Goat's Beard to Prickly Pear to Skullcap. Went to end of Skullcap (at Queen Anne) and did the GPS thing for Skullcap. Then took FS Rd 269 to Poverty Creek by Trillium and hiked just past Indian Pipe (never been on this part of Poverty Creek trail). Timing was a consideration and I decided to turn back and take Indian Pipe, also new trail to me. Then took the forest road all the way back to Queen Anne and GPSed that as well. Now only have entirety of Poverty Creek trail to GPS. When done with Queen Anne, crossed over to Poverty Creek trail and took back to the Pond and parking lot. Not bad averaging about three mph. Also saw five deer. Took Poverty Creek to Joe Pye to Horse Nettle to Teasel to Stinging Nettle to Joe Pye to Poverty Creek and around Pandapas Pond to parking lot. Drove car to Trillium trailhead off FS Rd 269. Hiked the remaining portion of Poverty Creek trail to the forest road. Returned on trail to Indian Pipe, taking that to the forest road and to the car. Saw 5 deer. This hike completed me hiking on all trails at Pandapas Pond: Indian Pipe and last portion of Poverty Creek trail! From lower lot took Poverty Creek to Woody to Goat's Beard to Skullcap, exiting on FS Rd 269. Took Poverty Creek trail back to parking lot. From upper parking lot, took Horse Nettle to Stone Crop to Snake Root to Poverty Creek to Pandapas Pond to Horse Nettle and the lot. Short bushwhack to stake out route of connector trail to Gateway from LuAnn's house. Named Pogo's Path by LuAnn's daughter Katie after their cat, Pogo. Basically same hike as last Sunday (11/16). Drove car to Trillium trailhead off FS Rd 269. Hiked the remaining portion of Poverty Creek trail to the forest road. Returned on trail to Indian Pipe, taking that to the forest road and to the car. Saw 5 deer. 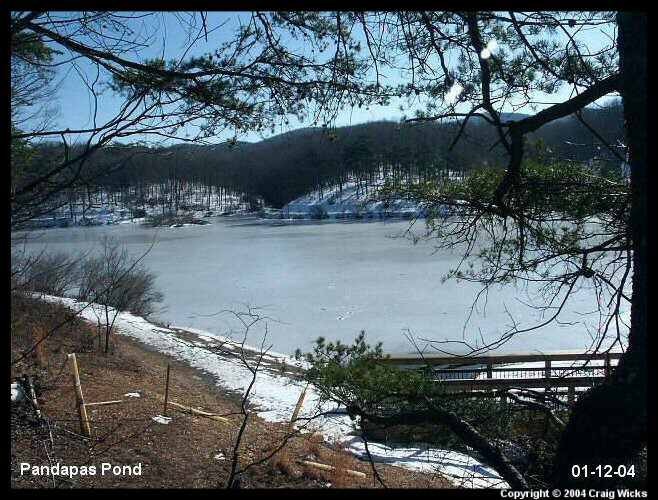 This hike completed LuAnn's hiking on all trails at Pandapas Pond! Joe Pye (and parallel trail) to Horse Nettle to Jeep Trail to Beauty to FS Rd 269 to Poverty Creek. Weather mostly cloudy, then darkening and light rain. At end of Beauty started to rain harder. Woody to Goat's Beard to Prickly Pear to intersection with Skullcap and back. Quick Thanksgiving Day hike... and I was late on top of it. Drove to Trillium trailhead and hiked Poverty Creek to Indian Pipe to FS Rd 269 and the cars. Bushwhacked Pogo's Path to Gateway to Jacob's Ladder to Poverty Creek to Snake Root and back via Gateway, etc. Saw three deer on Poverty Creek trail. Weather clear and cold, upper 20s. Our first really snowy hike this year... temps in upper 20s with snow falling steadily. From the lower lot, hiked around the Pond to Lady Slipper to Horse Nettle to Deerberry. At the end of Deerberry took FS Rd 188-2 to Teasel, where we saw a Golden Crowned Sparrow - a new bird for me on my "life list". This is a somewhat rare bird in the East... considered accidental or casual as it's typical range is out West. From Teasel we took Stinging Nettle to Joe Pye to Poverty Creek and back to the parking lot. A day for the record books... We had never hiked Poverty Creek trail in its entirety and today was the day! It is also significant in that we now have a digital voice recorder to facilitate more accurate and comprehensive hiking journal entries. Starting from the trailhead at the upper parking lot, we began the first 7.2 mile leg of our trek. The weather: mostly cloudy and about 30 degrees, with the possibility of drizzle/freezing drizzle and snow flurries. Poverty Creek trail follows along Poverty Creek for the first three quarters of it's length. Towards the end of this section of trail there are several creek crossings. In general, the first section of trail is an easy hike with many minor ascents and descents. The path is rocky in places and travels through various terrain including fields, forest, and pine forest, and a few Rhododendron "tunnels." The trail is well-marked throughout, with orange blazes. After crossing FS Rd 269 near Trillium, the last section of trail becomes a bit more strenuous, with larger and steeper elevation changes. Trail conditions today are variable, with areas of snow and standing water. It's interesting to note that Rhododendron and Mountain Laurel leaves remain on the plants during the winter. After passing Beauty trail about 50 minutes into the hike, we came upon our first creek crossing. Unfortunately (and as we expected) the water level was extremely high due to an inch and a half of rain that had fallen earlier in the week. This made a dry boot crossing impossible and we decided to abandon the trail at this point and take the forest road, rejoining it near Trillium. As already mentioned, the last section of trail is more difficult but arguably more scenic. The clouds were beginning to give way to more sunshine, though we started to run into some snow flurries. The wind picked up also and was becoming gusty. At 10:27, two hours and 17 minutes into our hike, I stepped out on to FS Rd 269 at the end of Poverty Creek trail. According to the GPS, the trek was 6.5 miles, although we were not able to follow the trail completely. Our speed was about three mph, which was excellent! The National Geographic map says that Poverty Creek trail is 7.2 miles long but I suspect it's really more like 6.8 miles, and most certainly longer than the 5.6 mile length the USFS claims. After basking in the glory of our accomplishment, we decided to return via the forest road, rejoining the trail where it links to the road between Jacob's Ladder and Snake Root. We arrived back at the parking lot at 12:25 PM, four hours and 15 minutes. Weather conditions: Beautiful day, partly cloudy and about 30 degrees. From the lower lot took Poverty Creek to Woody to Goat's Beard to Prickly Pear to Skullcap, following it to its end at FS Rd 269. We arrived at 10:00 AM, a journey of one hour and 20 minutes. Along the way we spotted what we think were two sets of bear tracks, the first sign of a bear during all of the months we've been hiking in the Pandapas trail system. Bears have been seen in the area, as attested by mountain biker Patty when we met back on July 24th of this year. Returned to lot via the forest road, joining up with Poverty Creek trail where it links to the road between Jacob's Ladder and Snake Root. We arrived back at the lot at 11:00 AM, an hour from the end of Skullcap. Saw a single deer as I drove out of the lower lot. Saw three deer - yearlings I think - near the lower lot as I drove in. Today's hike... Around the Pond to Lady Slipper, Horse Nettle, Stonecrop, Snake Root, and Poverty Creek back to the lot. Saw another three deer along Lady Slipper. Weather conditions today: overcast with temps in low 20s. Drove to Trillium via FS Rd 269. Took Poverty Creek to Indian Pipe to check out new trail on other side of the Pipe, thinking it may lead to the clear cut area with a vista towards Brush Mountain that we've been told about. Turns out this trail peters out to an area where there used to be a cabin, remnants of an old chimney could be seen. We decided to go back along Poverty Creek towards where we parked to check out another trail we've not been on before... apparently an old forest road. On the way we came upon yet another trail we'd not traveled, which subsequently led to the other trail we were heading for. The new trail (which we've dubbed Buttercup) dead ends at a clearing about 0.6 miles from Poverty Creek trail. There is no vista at the clearing but the trail is somewhat scenic. Returned to the car at 10:15. Weather conditions today: partly cloudy, 24 degrees with snow flurries. Drove to Gateway trail parking lot to take it up to Pandapas. Saw two Bluebirds at the beginning of the trail. Upon reaching Pandapas took Horse Nettle to Stonecrop to Wintergreen to Snake Root and back to the lot via Horse Nettle and Gateway trails. Trails were heavily snow covered, with Snake Root being pretty dicey and slippery to climb... not a good place to fall. Fairly windy along ridge tops too. Weather conditions: mostly clear and crisp... 15 degrees. About three inches of snow on the ground. I've been waiting at the lower lot since 8:30 for LuAnn. At 8:50 she called saying she'd be late. As it turned out, about 45 minutes late! Took Poverty Creek to Beauty to Queen Anne to Skullcap to Prickly Pear to Goat's Beard to Woody and back to the lot. Made it to Beauty at 10:00. Trail conditions: Lots of snow, areas of ice, some dry patches, crusty all the way. Saw a Hairy Woodpecker on Queen Anne near the small footbridge just before the junction with Skullcap. Nice to do this hike in the reverse of the way we normally do it. Good change of pace. Also noted that the sign for Prickly Pear is misspelled ("Prickley"). Weather conditions today: mostly clear and 30 degrees. Unfortunately I forgot my winter gloves so was forced to use my "fingerless" ones. Not very smart on my part. Decided to hike along the edge of Pandapas Pond to the connector trail near the Poverty Creek outlet to Joe Pye. From there took Larkspur where the two parallel each other, to Lady Slipper to Horse Nettle to FS Rd 188-2. Turned left on the road, taking it to the power line easement and Deerberry, where we arrived at 8:45. Deerberry back to Horse Nettle, then to Lady Slipper and back to the Pond and lot. Side note: met sis, bro, and mother at lot and took quick trip to Woody (not included in the above stats). Saw a Flicker near the connector trail from the Pond going to Poverty Creek. Weather conditions today: clear and crisp, no wind, mid-20s. Drove down FS Rd 269 to Trillium trailhead to hike tail end of Poverty Creek trail (2.5 miles). Saw and heard two Pileated Woodpeckers enroute. Made it to the end of the trail at 8:55, one hour and ten minutes. Decided to take the forest road back to the car. Before reaching the trail end, I took new trail along feeder creek (very nice) and mother continued on Poverty Creek. Another clear and crisp day, no wind, low 20s and on the way to a high of 51 degrees. Beautiful day for our last hike of 2003... Appropriately we are at Pandapas... and from the lower lot took Poverty Creek to Woody to Goat's Beard to Prickly Pear to Skullcap, exiting to FS Rd 269 at the end of Skullcap (9:35 AM). 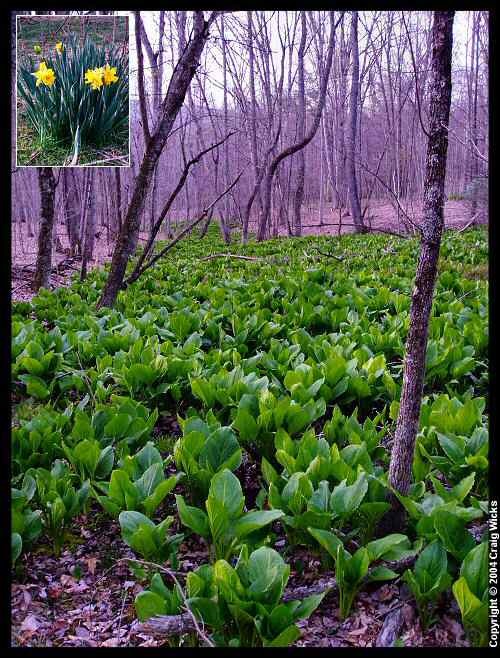 Along with the Rhododendron and Mountain Laurel, many of the woodland ferns are also still green, especially those covered by leaves or along the banks of creeks. From the end of Skullcap we took the forest road to the junction of Beauty at Poverty Creek, taking the latter all the way back to the lot. Took many pictures during the hike. Trail conditions today: most all of the snow is gone in the woods and none to speak of on the trails. Some icy patches on the forest road have lingered. Trail surfaces were frozen hard and crusty but would certainly turn somewhat muddy as temps increase later in the day. 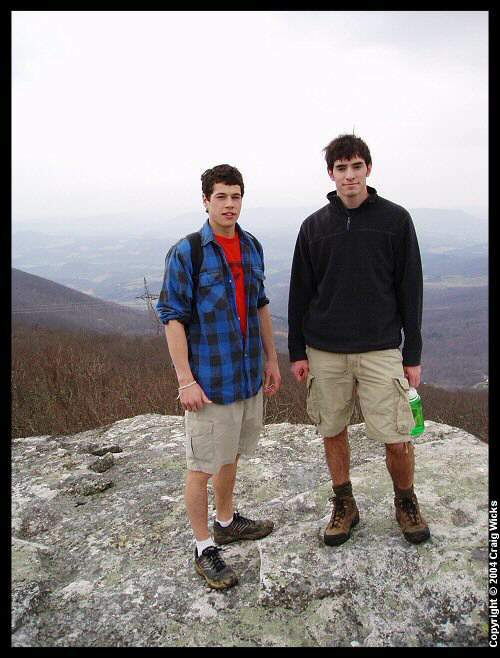 First hike of 2004. Weather: overcast, light rain, and about 45 degrees. Today I'm intent on finding Powerline trail, the last trail at Pandapas that I haven't hiked. Powerline is located off Craig Creek Road, which runs north from US460 just across from the entrance to Pandapas. After looking a bit more closely at the maps it appears that the trail begins just beyond the point where some high voltage power lines cross Craig Creek Road, roughly a mile from US460. Indeed I did pass the power lines and found a spot to park across the road from where I thought Powerline started. And I did find the trail! Unfortunately there is no signage but I did find an orange blaze and knew this was the place. There was a problem however... getting across Craig Creek, which was running pretty full. I finally managed and began my trek. Powerline begins with a short steep ascent then traverses the side of a ridge to what looks like an old forest road. Here the trail turns to the left and ascends to the first tower along the edge of a ravine. From the first tower a very nice view of the trail end high on the ridge in front of me, as well as the easement in the opposite direction. From this tower the trail descends to cross a feeder creek (where I scared up a partridge and a Pileated woodpecker), then steeply ascends again, eventually away from the easement and back into the woods via a series of switchbacks. About half way up the trail grade becomes less steep, finally coming back out of the woods into the easement again. From there it's just a short climb to the top. 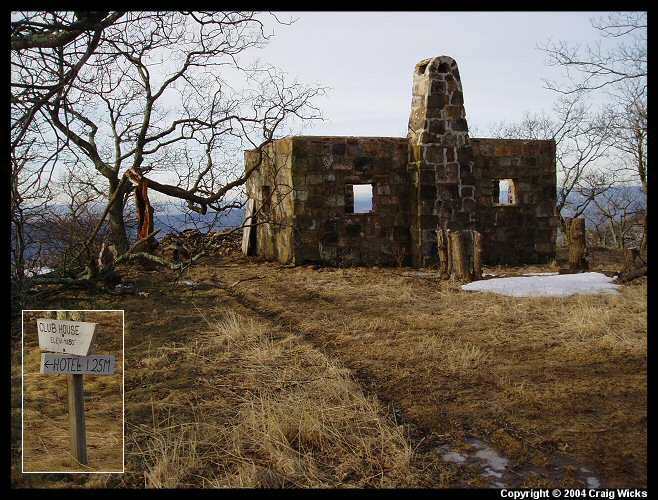 On top, spectacular views in both directions of the easement, some new home construction, a large pile of boulders, and the remains of what looks like an old fire tower. I spent a few minutes taking some pictures and then headed back retracing my route, the rain becoming heavier. I managed to get across Craig Creek again without getting wet feet. Due to the rain, the trail was muddy in some areas, especially at the top. There were also large patches of snow on the west side of the mountain. A relatively short but really great hike to kick off the new year! Weather: overcast and 61 degrees... I'm in my shorts! Took Poverty Creek to FS Rd 269 (between Snake Root and Jacob's Ladder) to Queen Anne to Skullcap to Prickly Pear to Goat's Beard to Woody and back to lot. Saw a deer carcass when exiting Poverty Creek trail at forest road. Another beautiful day to hike, with more blue sky towards the end. Weather: clear and 41 degrees, absolutely gorgeous! Photo op mission with both cameras and tripod. Primary goal is to test some new camera filters. Also to try out my newly configured hiking/camera waist pack. From the lower lot, took Poverty Creek to Woody where I stopped for about 20 minutes on FS Rd 269 to take some pictures. Continued up Goat's Beard to Prickly Pear to Skullcap to Queen Anne where I again stopped to take some pics next to the large footbridge, another 20 minutes. From there continued to the forest road, then took the spur back to Poverty Creek trail and the parking lot. Stopped for a moment along Poverty Creek to take a couple more shots. Trails were snow covered. Weather: overcast and 21 degrees. LuAnn's a bit late today. From lower lot went around the Pond to Larkspur to Joe Pye to Horse Nettle to FS Rd 188-2. Right on to the road to Wintergreen to Snake Root to Poverty Creek (some of it on the old Poverty Creek trail, which was moved some years ago to lower the impact of creek flooding) and back to the lot. Trail conditions: variably snowy with patchy areas of ice. Weather: partly cloudy and low 30s. First day of a new project to map all trails within the Wilderness Conservancy at Mountain Lake (click HERE to see the completed map). From the Mountain Lake Hotel parking lot, took Indian trail around the lake. The trail was covered with 4-6 inches of snow and many deer tracks. Indian trail has numbered stations along the path, a part of a self-guided nature walk. Completed the 1.7 mile trip in one hour, not too bad considering the snow. Incidentally, the lake is completely frozen over. Returned to the car for a quick break then set out for Bald Knob, taking Bald Knob road (1.0 mi.) 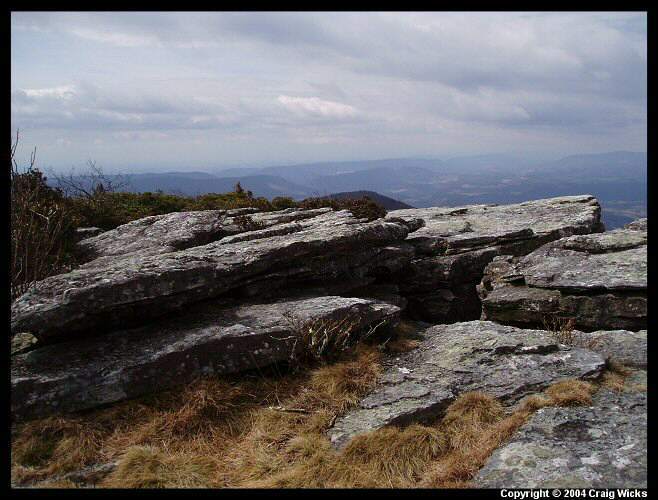 to the summit (4,385 feet elevation) then returning via Bald Knob trail (.5 mi.). The views at the Knob were spectacular (do click on the picture of the day to see). 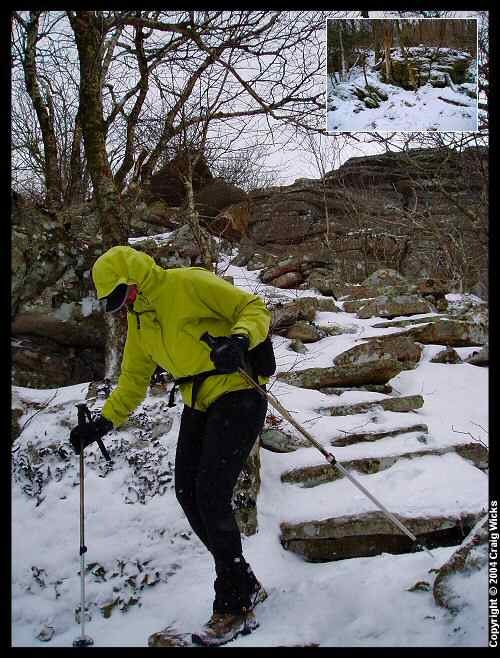 Trail conditions: 8-10 inches of snow, fairly difficult travel. Weather: clear and sunny, a bit windy with temps in the low 30s. From the hotel parking lot took Bald Knob road up to Bear Cliffs trail, which was further than we needed to go today. Retraced our steps to Old Turnpike trail, taking that to it's terminus at the horse stables. Followed a connector path to Lower Jungle trail and took that back to the parking lot. Trail conditions were pretty much the same as last week, roughly 8-10 inches of snow. Several trees down on Old Turnpike. Weather: mostly sunny and much warmer than yesterday. Estimate low 40s, absolutely beautiful! From the lot took Lower Jungle trail (.9 mi.) to Middle Jungle trail (1.0 mi.) to White Pine road. Took the road to Lower Doe Run (1.06 mi.) 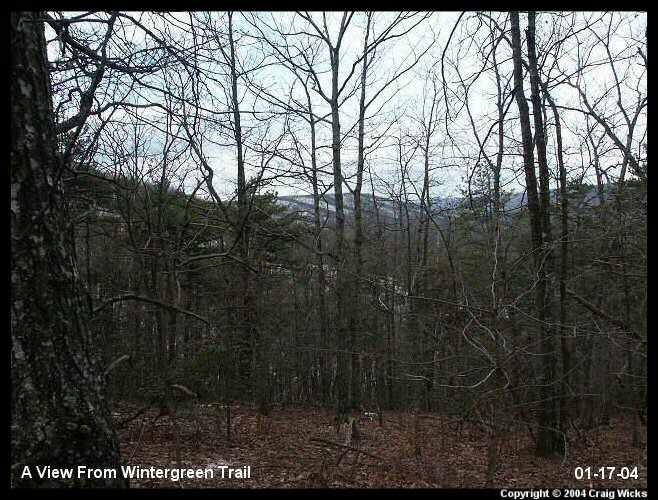 to White Dot trail to Upper Doe Run (.7 mi.) and back to the lot via Golf Course road. Trail conditions: snow covered (of course) and melting, which made it very difficult. Dry snow much easier to walk through. Saw eight plus deer along the first section of Lower Jungle and another group in the middle of Middle Jungle. Beautiful bridge and stream at the end of Middle Jungle. Several trees down on both Jungle trails. Some nice views of the surrounding mountains through the trees on Golf Course road. Weather: Clear skies and about 20 degrees. First time back at Pandapas since January. From the lower lot took Poverty Creek to Woody to Goat's Beard to Prickly Pear to Skullcap to Queen Anne. Walked across FS Rd 269 to the junction of where Beauty exits on to Poverty Creek trail and returned to the lot. 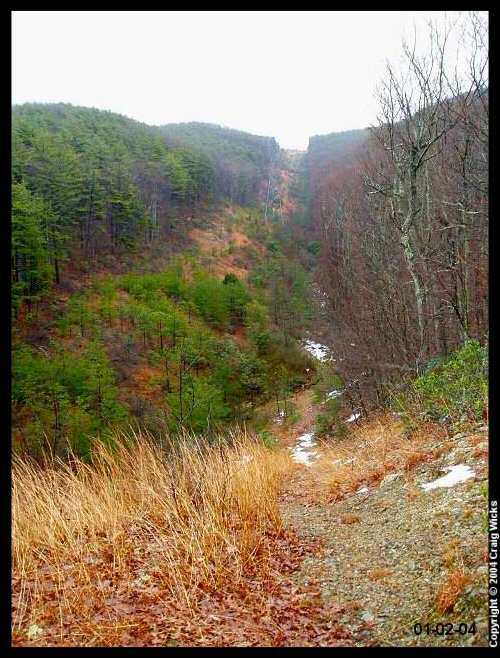 Trail conditions: mostly snowless and somewhat muddy on Poverty Creek trail near the end of the hike. Weather: Light overcast and low 30s. Parked at the end of Golf Course Rd and VA613. Took the road up to Salt Lick trail where several deer were startled. After taking a couple pictures of the hotel from the end of Salt Lick, continued up Golf Course road to it's end near the ruins of the old Golf Club. Beautiful vista from the front of the old Club looking down into the valleys and nearby mountains. Walked across the old golf course to the beginning of White Dot trail. Followed the trail to it's end at Girls Camp Rd. Followed that road back to Golf Course Rd and returned to the car. Trail conditions: some ice and snow on the roads, the trail was variable - sections with and without snow. Weather: Mostly cloudy and upper 30s. Parked at the hotel lot and took Golf Course Rd up to Salt Lick trail for another look at the hotel. My daughter Melissa is visiting from Michigan and going along for the hike today. From Salt Lick continued up the road to Upper Jungle trail - our primary target for today's hike. Took the trail to its end at White Pine Rd, then followed the road south to the NW end of Mountain Lake. Bushwhacked to Indian trail and found the connector trail that ends leads to the horse stables near the NE end of the lake (not blazed). From the stables took Lower Jungle trail back to the parking lot. Trail conditions were snowy, with Lower Jungle being more icy. Weather: Overcast with temps in the upper 50s. Parked at the junction of VA613 & 700. Target for today are the three most southeastern trails of the system: Spring, Bear Cliffs, and Homestead. Began my trek by taking Bald Knob Road up to Bear Cliffs trailhead. 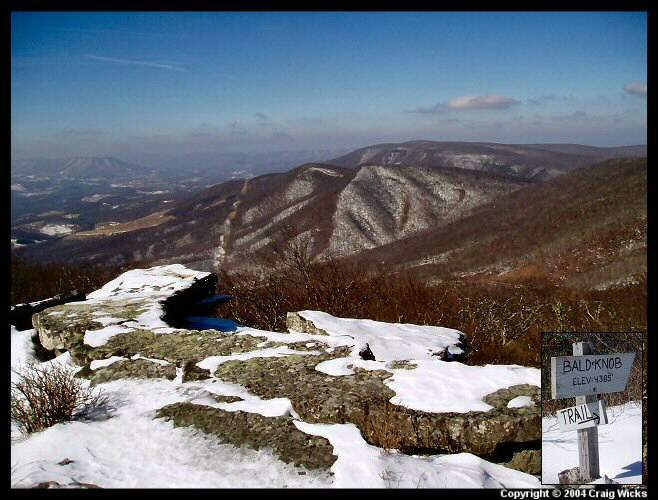 Most all of the snow has now melted, except for a few patches in the more shaded areas off-trail. Bear Cliffs trail gently slopes up to height about 150 feet greater than the trailhead elevation at which point there is some minor boulder climbing to do. From here the trail slopes down, eventually reaching the cliffs at 4100 feet elevation. The view from the cliffs is spectacular (see the pic of the day)... and yet another scenic vista available at the Mountain Lake trail system. Just before reaching the cliffs, more boulder climbing is necessary, not extreme by any means but probably would be considered difficult to the average hiker. Definitely an area to watch one's step! In all, the trail is considered difficult, not only because of the climbing but also because of its length and the many rocks that are strewn along the path. Spring Trail is located several hundred yards back up Bear Cliffs trail from the cliffs. It begins with a slight rise then drops significantly in elevation by about 220 feet. Except for a rather steep section on the trip down, I would consider this direction of Spring trail to be rated moderate in difficulty. However the trip back up is fairly strenuous and would merit a difficult rating. Incidentally, at the end of the trail there's a small earthen dam (Lawwill Dam) and a trail that leads to UVA's Mountain Lake Biological Station. After returning to Bald Knob Road I turned left (south) to the start of Homestead Trail, a few hundred feet from the Bear Cliffs trailhead. Homestead begins with a very long and relatively gentle descent of about 400 feet. Near this low point in trail elevation is a connector to Sartain (John's Creek) trail, which is outside of the Mountain Lake trail system and one I have yet to take. From here Homestead trail begins its steeper and shorter ascent back to Bald Knob Road. This section of the trail is most difficult, but considering all factors, Homestead trail is rated difficult from either direction. After completing Homestead, I took the road back to where I parked the car. Today's trek basically completes my initial hikes of the Mountain Lake trail system, although there is one short trail that needs to be finished: Blueberry Walk, about a quarter mile long. 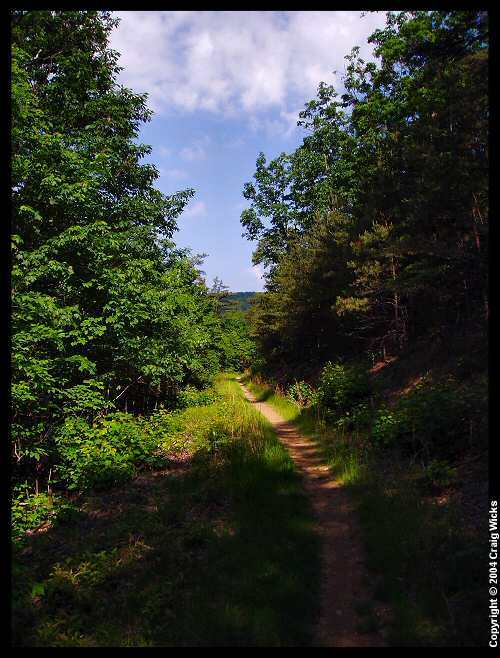 In addition, the connector trails associated with Homestead, Bear Cliffs, Old Turnpike, Lower Jungle, and Indian trails need to be surveyed. This effort should be accomplished during my next trip. One other note: wild turkeys were out in force today. I scared one up at the beginning of Bear Cliffs and a group of them at the end. Also saw a couple of them on Homestead trail. Weather: Clear, cool, and windy with temps in upper 20s. With LuAnn today! Parked at the hotel lot and took Lower Jungle to the Bear Cliffs connector trail. Made our way to Bear Cliffs trail up the very steep and rocky connector. Followed Bear Cliffs trail to the cliffs for another spectacular view of the valley below. Saw three deer near the junction of Spring Trail. We were shielded somewhat from the cold wind on that side of Salt Pond mountain, but on our return along the trail to Bald Knob Road, the shielding effect went away and we decided to skip going to the Knob and returned to the car via Old Turnpike and the connector to Lower Jungle. A hike cut short but still worth the trip to Bear Cliffs. 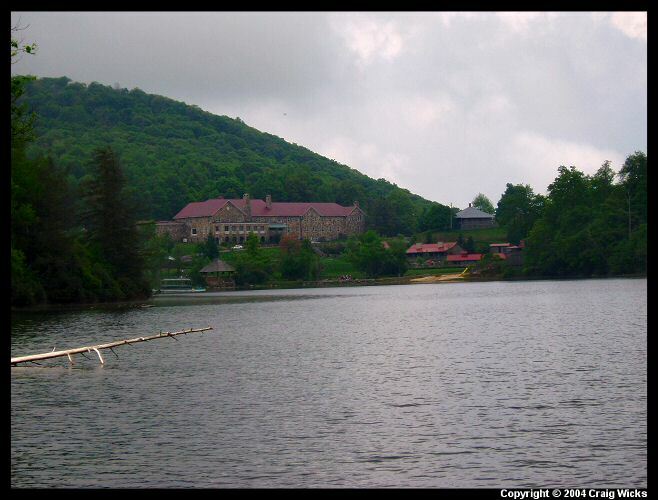 Note: Mountain Lake has thawed! Weather: Mostly cloudy with temps in the 40s to 50s. Today I completed my tracking of the Mountain Lake trail system... in a four-hour marathon. From the hotel parking lot (where one of the WCML cats came out to greet me) I started with Blueberry Walk then Girls Camp Road. 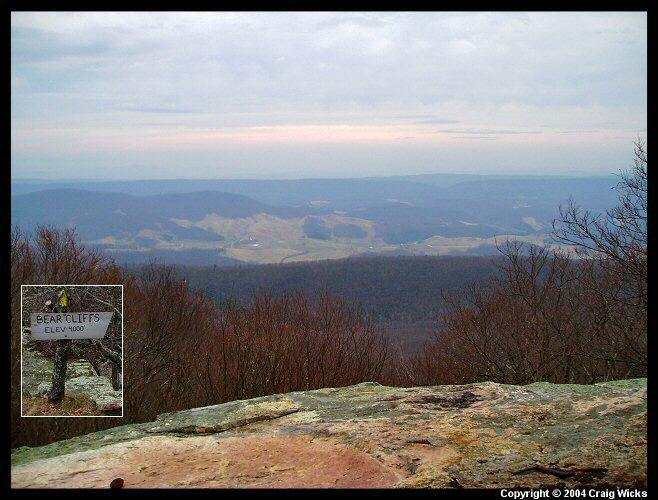 From there I took VA613 to Bald Knob Trail, scaring up a few pheasants and a rabbit. Took Bald Knob trail (EXTREMELY steep and rocky, with some climbing necessary - the ground enroute still a bit frozen) to the Homestead connector (awesome views - but cold and windy on the Knob), then traveled along the HV power lines after a short break at Upper Homestead where there's another nice viewpoint, to Lower Homestead and down to Johns Creek Trail. Along the way saw my first butterfly of the year. Started out on Johns Creek trail (several beautiful rhododendron tunnels) to it's terminus at the Creek, having to step around several running streams right on the trail. Also saw another - unnamed - trail to the south. 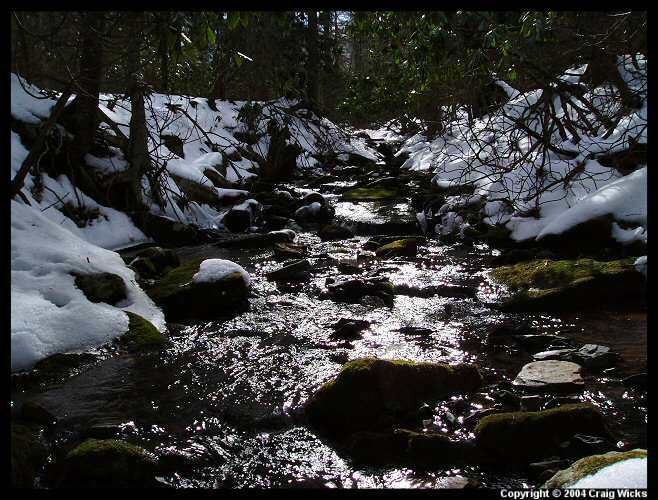 Crossed yet another stream, perhaps the actual headwaters of Johns Creek, eventually making my way to the end. After another short break (saw a fairly large "kill" that I chose not to investigate), backtracked up Johns Creek and Lower Homestead trails, where toward the end I startled a small group of deer and several pheasants. 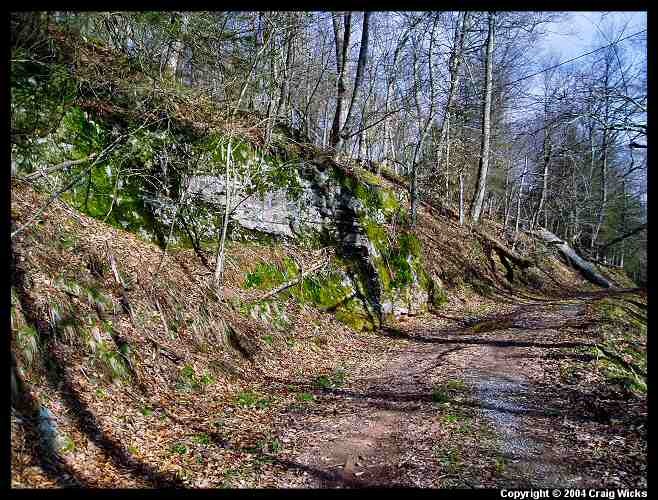 After the end of Lower Homestead, where the trail gets pretty rocky, I proceeded along Bald Knob Road to the Chestnut Lodge connector off Old Turnpike near the road. I then took the other Chestnut Lodge connector to the other connector between Old Turnpike and Lower Jungle trails. Followed Lower Jungle to the connector to Indian Trail and back to the hotel. Weather: First day of Spring! 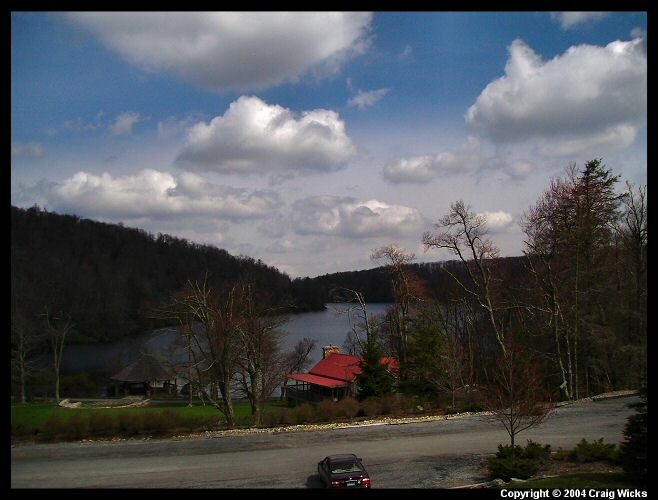 Clear skies with temps in the low 50s (according to the thermometer, 54.4 degrees F). With LuAnn... From the hotel parking lot took Golf Course Lane to Salt Lick Trail for a quick view of the hotel. 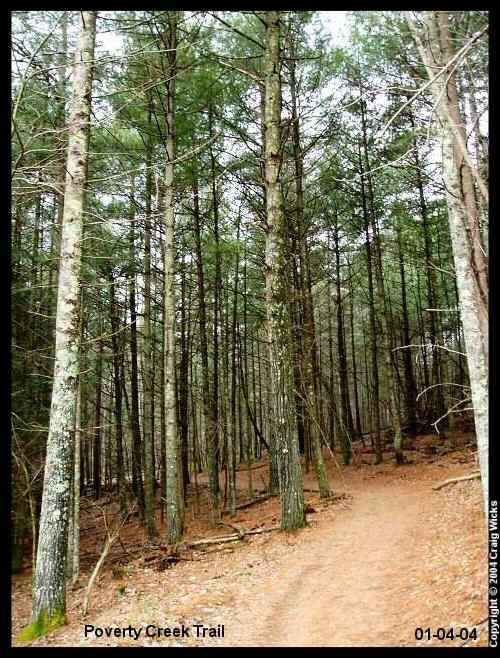 From there continued to Golf Course Road to the ruins of the old golf club house, then to White Dot trail to Lower Doe Run and along White Pine Road to Middle Jungle trail (saw three deer just before exiting Lower Doe on to White Pine road). The walk along White Pine road is spectacular, high above the Drain and with multiple mini-waterfalls all along the way. Need to go down to the creek one of these days! On Middle Jungle, stopped for a few minutes (and pictures) at the bridge over the "Pond Drain" (now dubbed "Skullbridge" because of a deer skull LuAnn found) just several hundred feet from the road, then followed the trail to VA613, bushwhacking to the connector to Indian trail. From there hiked along the east side of Mountain Lake back to the parking lot. Weather: Mostly cloudy with temps in the 50s. From the hotel parking lot took Lower Jungle trail to the connector to Old Turnpike trail, then Bald Knob trail to the Upper Homestead trailhead. From there went to the Homestead connector to Bald Knob to Bald Knob trail (saw my first Yellow Bellied Sapsucker about midway down Bald Knob trail, very cool!) and back down to Indian trail, walking along the eastern shore of the Lake. Found a blue blazed trail among huge boulders at the north end of the Lake, eventually hooking back up to Indian trail. From there took the connector up to the horse stables, then Lower Jungle trail back to the parking lot. Guests today: Myles and Mitch, students from Virginia Tech. Weather: Partly cloudy with temps in the low 60s. Fallingwater Cascades Trail, a short yet moderately strenuous hike. From the overlook parking area followed the trail down along Fallingwater Creek, crossing the creek several times, then finally over the last bridge and back up to the parking lot. Encountered a recent tree down on one section of the trail near the bottom, which was a bit difficult to maneuver around. The cascades are nice, flowing over large flat boulders. Good scenic hike and worth the effort. Weather: Partly cloudy with temps in the upper 40s. From the hotel lot, stopped for a moment to see Dave Deshler at the Wilderness Conservancy, then took Bald Knob trail to the Homestead connector and walked along the power lines to Lower Homestead. Followed that back to Bald Knob road to Old Turnpike to the connector to Indian trail near the horse stables and back to the hotel along the east side of the Lake. Beautiful day but a rather chilly wind at the Knob and along the power lines. Weather: Snowing! 4-5 inches on the ground, very cold (low 30s), windy, overcast. Like walking back into full-blown winter, from springtime in Blacksburg (and no snow). With LuAnn, from hotel lot took Lower Jungle to the connector to Old Turnpike to Bald Knob Road to Lower Homestead trail. Completed Homestead trail to the Homestead connector to Bald Knob. On the Knob, the wind was whipping... perhaps gusts to 35 mph and extremely cold! Spent no time on the Knob, taking Bald Knob trail back to the parking lot. Trail conditions: lots of snow! Also, lots of visitors at the hotel. Hualapai Hilltop to Supai Village. Weather: Clear but for a few clouds and 55 degrees. A detailed account of this trip is available HERE. Briefly... 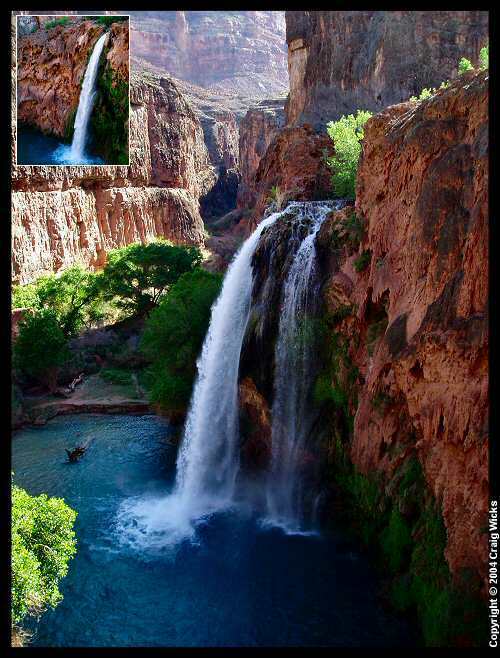 It's eight miles from the Hilltop to the Indian village of Supai, descending from about 5,000 feet to 3,500 feet. The first 1.5 miles is steep but as the canyon narrows the descent becomes more gentle. This is considered one of the top ten treks in the world, and the second one for me and LuAnn. We got a bit of a late start because we decided to go to Seligman, AZ for breakfast, after staying in Peach Springs, about 30 miles away. Lots of people hiking this trail and many mule/horse trains using it as well. The scenery was spectacular! After arriving at the village around 3:15 in the afternoon, we set up camp and decided to hike down to Navajo Falls, the first of three major falls to visit. About a mile into the hike we learned that the Falls were much farther than we thought so we returned to the village for dinner and sleep. 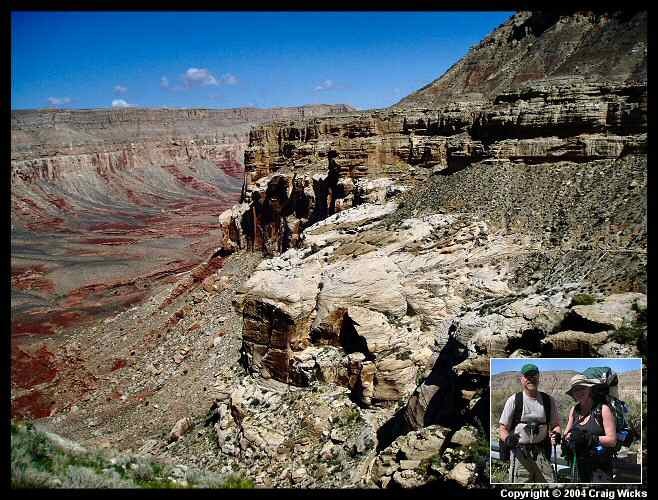 Click HERE for more about our Havasu Canyon Trail hike. Supai Village to Moody Falls. Weather: Another beautiful day with conditions similar to yesterday. After a horrible night of sleep with the village horses and dogs making noise all night (and our host's dog jumping on the tent, we made our way to the cafe for breakfast. Given how the night turned out we made the decision to see if we could leave today - one day early - hopefully by helicopter. Well, the helicopter doesn't fly on Saturday but we could get a ride out on horses. Deal! So after breakfast we hit the trail again, with the goal of viewing the three best waterfalls and get back to the village to meet up with the horses by 2:00 PM. The first of the falls, Navajo, was beautiful! The next, Havasu, was awesome, with a drop of 100 feet and featuring twin falls! The last, Moody, three miles from the village was breathtaking, dropping 200 feet into the canyon! With our two o'clock commitment we returned to Havasu Falls to spend about 45 minutes taking in the scene. LuAnn felt compelled to take a swim in one of the crystal clear pools at the base of the Falls. Go for it, girl! Reluctantly we returned to the Village and made our way out of the canyon back to the Hilltop, a 2.5 hour trip. Weather: Partly cloudy and 55 degrees. With my mother today, with our first stop to change the flowers near where we scattered dad's ashes. Hoping to see some flowering trees during our trek too. Noticed a few trees had been felled along the walkway from the parking lot to the Pond. From the Pond took Woody (where we saw some Daffodils at what looked like possibly an old home site) to Goat's Beard to Prickly Pear and to Queen Anne, where we exited on to FS Rd 269 near the junction of Beauty and Poverty Creek trails. Returned to the Pond and parking lot via Poverty Creek. Saw several deer and a handful of flowering trees. Weather: Mostly cloudy, low 60s. From Hotel parking lot took connector off Lower Jungle to Old Turnpike to Bald Knob Road to Upper Homestead and the Homestead connector trail to the Knob. From there returned to the Hotel via Bald Knob trail. Weather: Solidly overcast (and somewhat foggy), low 50s. With LuAnn. From Hotel lot took Golf Course Lane to Blueberry Walk to Golf Course Road to Upper Doe Run to White Dot trail. Followed that back to Golf Course Road to Upper Jungle trail down to White Pine Road. 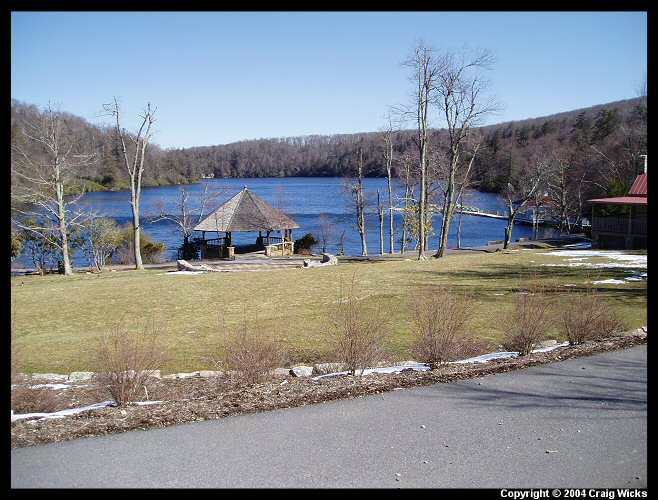 Followed the road to VA613 and crossed to the west side of Mountain Lake, following Indian trail back to the car. Towards the end of our hike the overcast skies were beginning to burn off. Weather: Beautiful day, mostly clear with some fog in the mountains, low 50s. Parked at the Gateway trail lot, taking Gateway to Old Farm to Jacob's Ladder to Poverty Creek to Snake Root and back to the car via Old Farm/ Gateway trails. Have the digital camcorder with today. Scared up a few deer near the end of Old Farm on my way to Jacob's Ladder. Lot's of flowering trees... Dogwoods, etc. Nice to have the greenery of the woods back after winter. Saw a couple of cyclists near Poverty Creek/ Snake Root. At the top of Snake Root, someone had built a fire sometime ago, the coals of which were still warm. Also left a roll of toilet paper. I was kind of irritated because the person making the fire also burned part of the log I usually sit on. Ended the hike with warmer temps and a few clouds. Weather: Mostly clear, mid 60s. From Hotel lot followed Golf Course Lane and Road to the ruins of the old club house. 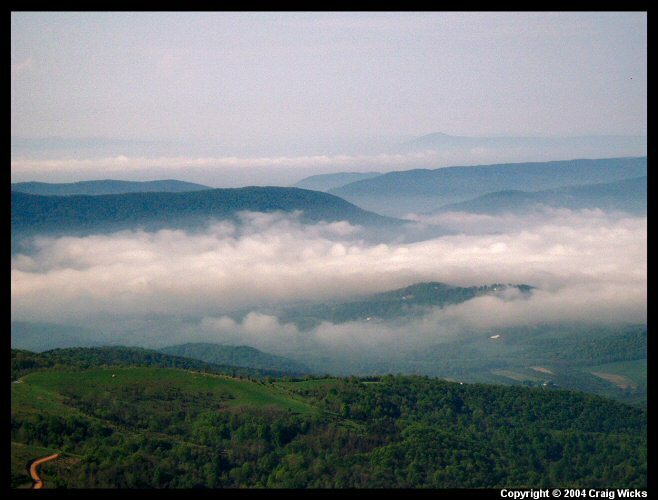 After enjoying the view from there for a few minutes (spectacular with fog covering the mountain valleys) continued on our way taking White Dot trail to Lower Doe Run to White Pine road. Followed the road to VA613, then took Indian trail back to the car. Weather: Thin overcast and low 60s. The Forest Service is working on the road and lower lot! With LuAnn. Today's journey took us along Woody to Goat's Beard to Prickly Pear to Skullcap. From the end of Skullcap, followed FS Rd 269 to Poverty Creek near Beauty. Followed Poverty Creek trail back to the car. The Mountain Laurel is starting to bloom! Weather: Yet another beautiful Spring day! Low 80s and partly cloudy. With Nicole. First time on Huckleberry trail, which runs between downtown Blacksburg near the library to the New River Valley Mall in Christiansburg. Followed the trail out of Blacksburg for about two miles, then returned to the car. Hiking four miles in sandals is NOT recommended. Weather: Mostly cloudy and mid 60s. Today taking it easy, deciding just to hike Indian trail. Short and sweet! Weather: Still mostly cloudy but temps warming to the mid 70s. After lunch at the Hotel decided to drive up VA613 to the parking area for Wind Rock. 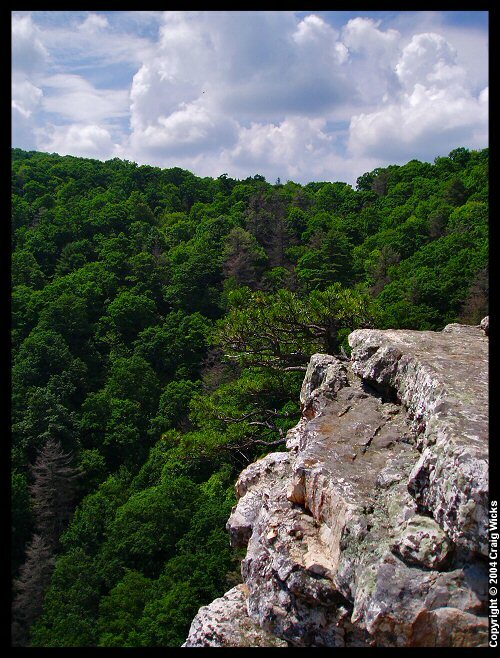 Just a short half mile hike to the spectacular overlook, where you can see into West Virginia. Met an AT thruhiker (didn't realize it at the time) and a couple at the Rock. The view was breathtaking! Weather: Clear skies, upper 60s. With LuAnn. From lower lot took Larkspur to Joe Pye to Horse Nettle to Snake Root and back to the car via Poverty Creek trail. Lots of flowering Mountain Laurel. Weather: Hazy overcast day in the mid 60s, foggy in surrounding mountains. Took the connector from Lower Jungle to Old Turnpike to Bald Knob Road and up to the Knob. Windy and a bit cooler up there. Continued taking the Homestead connector to the powerline easement, following that to Lower Homestead to Bear Cliffs trail. Hiked to Bear Cliffs and returned to the Hotel via Bear Cliffs trail and connector. Saw a yearling on the drive up this morning but none along the trails. Did hear a wild turkey clucking towards the end of the hike. A very wet hike today and my boots were soaked. Also forgot to take my camera, so no pic today. Weather: Hazy with building cumulus towers. Storms likely later today. In in the mid 80s. GPS mapping hike to finalize the new DX Hiker trail map of the area. Took the Lower Cascade trail along Little Stony creek to Lower Cascades falls. Saw a toad. Paused for a short break at the falls (photo op) then continued along Upper Cascade trail looking for the junction with the Nature Conservancy trail. Found that and followed to the junction of Barney's Wall trail. This is the first time I've been on either of these trails. Followed the trail to Barney's Wall, an outcropping overlooking the gorge of the Little Stony watershed (see pic of the day). Beautiful vista with increasing cloud building activity. Windy conditions here. Returned to Upper Stony trail by the same way and took it back to the parking lot. This is the last hike of my "Year To Remember," adding to a final total of 573 miles! 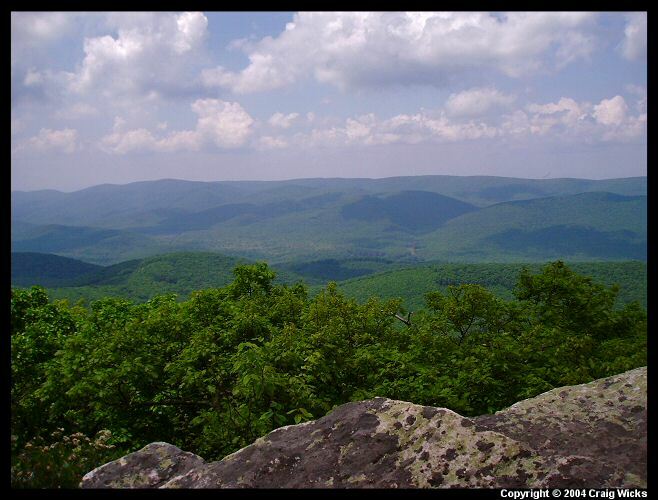 Anniversary hike of my first Virginia hike, July 6, 2003 (not counted in above stats). Weather: Clear skies, low 70s. With Bess, my mom. From upper lot took Horse Nettle to Larkspur to Joe Pye to Horse Nettle and back to the car. Short hike but wanted to do one today in celebration.